This is the salad I ordered along with the Panera Lentil Quinoa Broth Bowl with Cage-Free Egg. Even though the main component of this salad is arugula, the dressing helped mask its flavor. I wish there was more of it since the large chicken pieces were a little overpowering. Maybe next time I’ll ask for it on the side so I can control the dressing-to-salad ratio better. I was a big fan of the apples and grapes in this salad. The ancient grains add a really nice texture. I ended up picking through the salad and targeting the fruits, leaving behind the chicken and arugula. For most salads at Panera, I haven’t been a fan of their chicken. Usually I ask for the salad without chicken, but I thought I’d give it another chance in this. They must use the same chicken in all or most of the salads, because it tasted like the same chicken I dislike. I’d enjoy this salad more if there was less chicken and if it was served on something other than arugula. 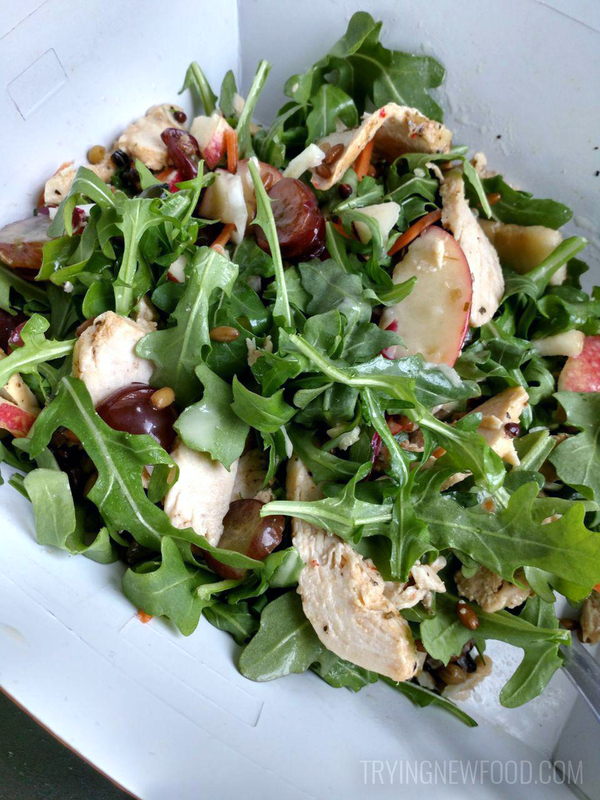 If you like the savory flavors of arugula and want something with a sweet twist, try out this Panera Ancient Grain & Arugula Salad with Chicken. For me, it’s a no. Maybe next time I’ll see if there’s a way for me to switch the arugula out for something else. What’s your favorite salad from Panera? My favorite You Pick Two combo is the Asian Sesame Salad with Broccoli Cheddar Soup. I’m always open to suggestions of any awesome Panera foods to try out. Let me know!